In a world without science, what would cause society to widely lose belief in the fundamentals of its religion? There's a religion based on the premise that the priests are protecting the general public from evil magic. Use of magic is taboo. What they call magic is actually leftover technological artifacts — mostly weapons — from an ancient, very advanced period. Now magic is extremely rare and the majority of people have never experienced it in their lifetimes. This has lead to the majority of people no longer believing that magic actually exists. Now the problem is, why would people stop believing (but without actually leaving the religion entirely)? In our world, it's usually science which causes people to lose belief in religious dogmas (and while some lose faith altogether, others simply adapt their belief system to fit what they know from science). But in that society, there is no science whatsoever; they are essentially back to medieval thinking, and in medieval times, lack of evidence certainly didn't make people disbelieve. So my question is: Is there a way to make this setting believable? Edit: I do not want the religion to be replaced by another one. I want the religion to be dominant, and in particular the values of the society to be based on that religion. I just want the majority of followers no longer to believe in the basic claim that there's magic and that the priests protect them from that magic. Also, by “science” I basically mean the scientific method (and in particular, the way of thinking that comes with it). A lull before a schism. The main problem here is that people should become non-religious without any alternative. It is in human nature to demand answers about the world, and if a religion does not provide those answers, people would inevitably turn to other religion, or atheism. 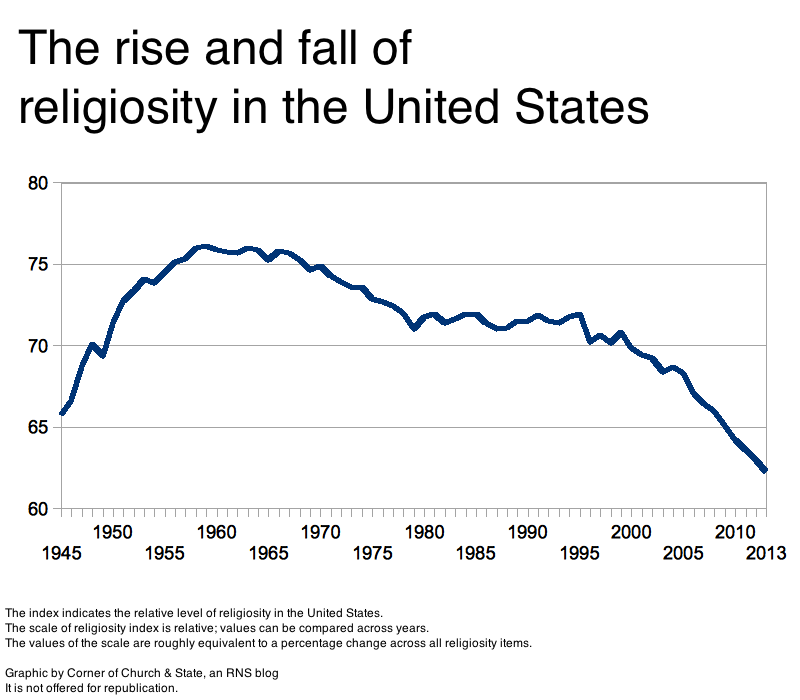 So the solution here is the decline of original religion. While clergy still keeps hold on most social aspects of human life, ordinary people no longer respect the priests and no longer truly believe that the world works according to the tenets of religion. Priests had become too corrupt and self-centered, and miracles are no longer seen. Still, speaking against the religion is blasphemous and would bring severe reprecautions upon the dissenter. Thus, ordinary people are just grudgingly follow along without raising their voices and without expecting any boons from the heaven. Superstitions and "witchcraft" is on the rise, but no one has stepped up openly yet to confront the religion itself. This situation can not last for long. Eventually, a new prophet like Muhammad or religious activist like Martin Luther would rise, and people would rid themselves of the old discredited priesthood. But new (or reformed) religion would blossom, and people would once again become more religious - not less. The batteries have been depleted in the artefacts. People are naturally curious, scientific method or not. Someone, somewhere, is going to sneak into a chapel, pick up one of these technical artefacts, push buttons et al and realise nothing is happening. This can be explained by the priests; you don't know what you're doing. It only works for us. You're really lucky nothing DID happen; you could have blown yourself up without understanding how to work things. So, the next best thing is to wait for (or possibly engineer) something serious happening that the priests would normally intervene on. When they don't bring out the artefacts, the excuses continue, but the reality is that unless we see it for ourselves, it's very hard for us to believe that something really special and out of our normal range of experiences can actually happen. What, in essence, you're asking is whether or not people can adhere to a religion without any proof, and the answer is yes. Jesus is documented in the bible as having raised people from the dead. Modern Christians have never seen this happen in a faith context but that doesn't stop Christians from believing in Jesus. Most modern Christians I know will tell you if pressed on it that Lazarus was probably in some form of coma, that Jesus didn't really raise him from the dead, but that doesn't stop them being Christian. Let's take that to a more logical extreme. The bible also tells you that the earth is only 6000 years old or so. But, with the exception of a few notable cases, again most Christians I converse with simply don't believe that and consider a 'day' in the first chapter of Genesis to be a metaphor of some kind. Regardless of what you might think, this is only partially the result of science; modern religion doesn't exercise miracles and therefore people begin to doubt the existence of the miraculous. The entire universe and the Earth being created in 6 days, well that would be pretty miraculous. Your question is therefore the wrong way around. What you're describing is the natural order of life, scientific progress or not. We don't tend to believe in things we've never seen that would contradict the things we have. The more interesting question would be what would it take for people to maintain their belief in the face of never having seen these 'miracles' you describe - that's the far less likely circumstance. Studies have shown that the fraction of the population that is highly religious is only something like fifteen to twenty percent of the people. This is an area where in the internet isn't your friend. Any check only throws up census data about the professing believers in a wide variety of countries. What this answer discusses are those people who are devotely inclined to be inclined. The majority of any population simply fits into their dominant culture. Interestingly there has always been a fraction of any population who lack any capacity to believe in a religion. We can them the irreligious. They are natural born atheist and agnostics. Human brains generally very susceptible to accepting religious beliefs. This fact alone explains why religions are so widespread and often culturally dominant. This explains why the small fraction of the strongly religious can impose religion on societies. Now if the irreligious fraction of a population had both grown large relative to the rest of the population, and become dominant in the ruling classes of a society, then their culture could readily move in the direction of losing faith in their religion. Essentially this is a reversal of the normal situation where the religious are able to propagate religion to become part of a society's cultural norms. Please note there will remain that core percentage of the population who are religious believers. Basically all that is required is sufficient conditions for religion not to continue as a society's norms and values. This answer proposes this could occur if the irreligious are the dominant drives of the society's cultural vales and norms. Increasing education certainly helps the decrease in religion in society when more people are encouraged to think for themselves. Someone comes across a hoard of ancient tech. ***** They don't need to understand it, just understand its potential. A single encounter between an individual who defies the orthodoxy of the priesthood, with a fully functional tech device - in front of witnesses would sow the seed. Gatherings, distribution of parts of the tech to disgruntled supporters willing to defy the Priests and their supporters (i.e. the oppressed fight back) could lead to a more major confrontation. Word would spread, whispers heard in every quarter, the priests would be stunned, meet in their councils and plan a response. A confrontation would occur, the priests in their arrogance would assume certain victory. The desperate populace carefully plan their part of this - their knowledge of the priests ways - their passion for survival overcoming their fear, they win. The priests are shocked, they hold up in their place of power, fortified as they can be. A final confrontation occurs, Through overwhelming numbers, ingenuity - but most of all willingness to self sacrifice overcomes the priesthood. That's a familiar pattern or trope found in fiction. In 1755 there was a major earthquake. It happen when most people were in church for service. Lot's of people died in the process of praying to god. This is one of the seeds of modern atheism. People could just not understand that if there is a god, and he controlled earthquakes how this could happen. Imagine this magnified. Maybe the pope of the religion in the most important religious event of the year, surrounded by thousands of followers mid prayer is stuck by lighting and killed. Maybe this won't create atheists, but it sure will make most people think that this religion is not the right one. The organisation will fracture and crumble. It will take a long time to rebuild to a world accepted religion. A shift in theology. As the priesthood runs out of actual "magic" to find the part of the priesthood that was in charge of the inquisition starts to make problems for the rest, by increasingly trumping up charges against the innocent just to justify their jobs and their power. Eventually they have to be purged before they create a backlash and/or try to forcibly take over the church leadership and after the purge the new teaching was that "magic" used to exist but was extirpated by the power of the god, it's source destroyed. So the public at large still believes in magic to a mild extent, but not as something they'd ever expect to see in the present tense. Alternatively the inquisition won and the religion has become so pestilentially oppressive that people only observe it out of fear. Such a religion is of course ripe for a backlash and replacement by a new faith. This is a very interesting question! Have my updoot! I can only come up with CURIOSITY as my answer. "Where is the big truck? Severe beating issued after that, no joke. Curiosity doesn't need science, it just needs a simple question, and when people start asking questions, they'll do anything to get their answers. The simplest answer is that the old religion is overtaken by a new one. This has happened many times in history. In terms of numbers the best examples are Christianity and Islam. What you need is a charismatic leader who is determined to start a new religion (perhaps cynically like Scientology was) or through a revelation from God - like Moses. The old religion is outcompeted. Christianity created a need for its services. This was the idea that you got eternal Heaven or eternal Hell based on how you worshipped and believed in this life. The Romans were all on the way to Hades before that, good or bad. The Heaven option looks promising. Grassroots conversions, starting with the lowly. Exclusivity. If you are a Christian you can't be something else too. Islam takes the Ten Commandments a bit further: "There is no god but Allah". You could take a page from Islam also. When the conquering Muslims showed up they did not convert everyone. People converted of their own accord because if you were living in muslim controlled lands, it was good to be a Muslim. Plus these Muslim folks clearly had a good thing going on - so maybe they were right about Allah. In your world that is how the magic religion is set aside. It is outcompeted by more modern, timely religions that have more to offer their adherents. I come from a Mormon background and no longer believe. The most common reason why people leave Mormonism is discovering troubling information (typically historical or operational in nature and often both) more than science, which is mostly embraced by believing Mormons. We came to realize that the outside world we were taught to fear is not so scary and that our religion and its leaders were not who they claimed to be. We were free to embrace science without nuance or restriction upon leaving, but science isn't really a core factor in most ex-Mormons' disaffections. It wouldn't be much different for this type of society. People would discover the corruption of the priests and historical issues that invalidate their authority. They might also find spellbooks, cast spells, and discover that they aren't so scary or worth being superstitious over. They would likely do so in secret due to the taboo. This religion would have to be very high-demand and extremely dominant where apostates are severely punished or shunned by society to the point where it would be next to impossible to survive. There would be a number of people who are "Physically In, Mentally Out" (PIMO) who simply keep up appearances so as to not starve. They might form small tight-knit communities, but it would be extremely risky to tell anyone if the religion also includes a duty to narc. It would look a lot like rural Utah or an Islamic state. The religious elites can't hide their corruption and problematic history forever, neither can PIMOs pretend to believe forever. As the number of PIMOs increased, an underground network would begin to form that would provide the backbone for people to safely apostatize. Once apostates reach a critical mass, the religious elites would lose most of their power and the religion will go into decline, especially as spellbooks become more widely available. Having been raised in a highly controlling environment, the network of apostates is very likely to be a decentralized community, so this wouldn't be the replacement of one religion by another. They would also likely be atheistic for life, though some would find solace in mysticism and other religions. Religion today didn't decline due to science. It declined because of Communism, women and welfare. The largest source of religious decline today is Communism as interpreted by Stalin and Lenin, an ultra violent variant of socialism that seeks to crush religion and destroy temples. You could have that- a widespread anti religious revolution with the church buildings being burnt and the priests burnt to help spread the joys of socialism. In the west other factors were key. Women entering the work force en masse, was a major factor. Women are more likely to be religious, and are more likely to get their family involved, and with work have less time for religion. Wealthier people are less likely to need religion, as they no longer need the charity of a community. Welfare, therefore, tends to reduce and replace religion. As such, I suggest you combine the three- have a worldwide socialist revolution fighting back against the perceived corruption and cruelties of the church, one which promotes welfare and female equality and aggression to priests. As such, with less women leading their families into religious services and alternatives proposed by their influence people wouldn't believe in the mystical claims of religion as much. The elite bourgeoisie of course would have better records of how bad it would get if all the priests were killed, and so you'd have an active class struggle between the radicalized peasants who believe that religion is simply a tool for the elites to extract money and fealty from them and the bourgeoisie who want to extract money and fealty from peasants and promote a religion that they know stops terrible evil things from happening. Not the answer you're looking for? Browse other questions tagged reality-check society religion or ask your own question. What common structures and systems exist in global organized religions? How would a world be constructed in which there are both a high-tech race and a medieval race? How would a post-religion society be in a still religious world? Could a world where two neigbouring countries, only one of which uses 'magic', exist? Would magic cause a medieval society to stagnate rather than progress technologically?